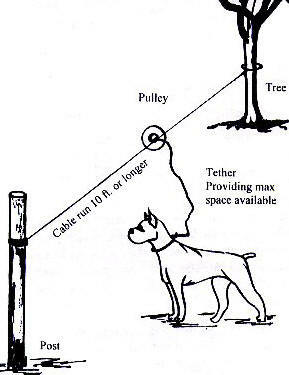 Trolley, pulley, or cable run for your dog is one humane alternative. Here are come links to websites that offer step by step instructions for building your own. I deserve more than being a prisoner in your backyard. In the state of California it is illegal to tie your dog to any stationary object for more than a 3 hour period within 24 hours. Click here for a more details on this law. Generally speaking, the terms “tethering” and “chaining” refer to the practice of fastening a dog to a stationary object and leaving him unattended. The term “chaining” tends to refer to situations where thick, heavy chains are used. “Tethering” is more often referred to partial restraint on a rope, lighter chain or pulley, which is the more prevalent form of tethering. These terms are not meant to refer to an animal being walked on a leash, or cases of supervised, temporary tethering while an owner is present. The owner is trying to protect his dog from something on the other side of their fence (kids, another dog, etc.) by keeping the dog in one area in the yard. The owner's fence is damaged, or the owner doesn't have a fenced yard. The dog's behavior makes keeping him indoors challenging, and the owner doesn't know how to correct the behavior. The pet owner comes from a family that always tethered dogs, and may never have realized there were better options. It is common for continuously tethered dogs to endure physical ailments as a result of being continuously tethered. Their necks can become raw and sore, and their collars can painfully grow into their skin. They are vulnerable to insect bites and parasites, and are at high risk of entanglement, strangulation, and harassment or attacks by other dogs or people.